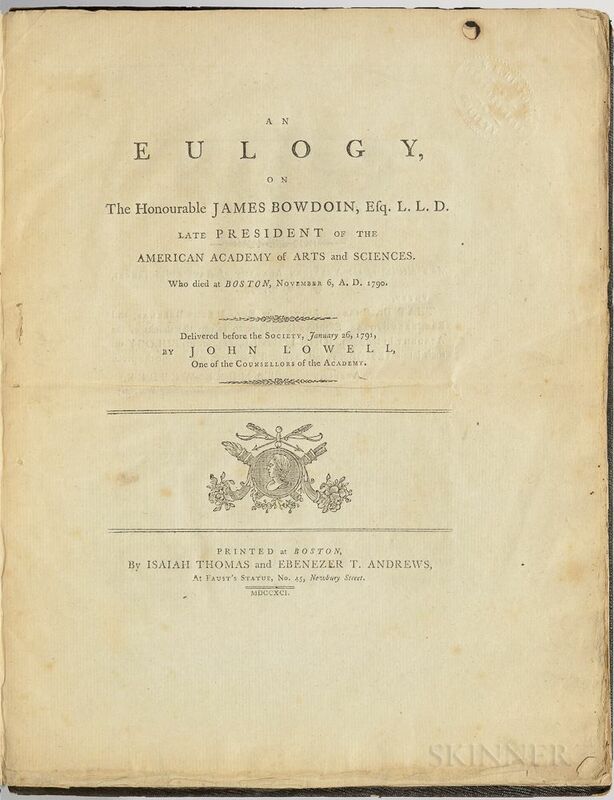 Lowell, John (1743-1802) An Eulogy on the Honourable James Bowdoin, Esq. L.L.D., late President of the American Academy of Arts and Sciences. Boston: Isaiah Thomas & Ebenezer T. Andrews, 1791. 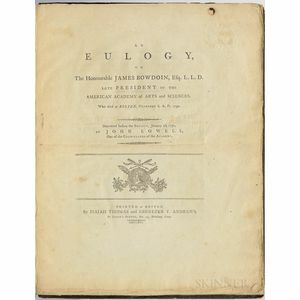 Large quarto, half-title present, later textured cloth binding (lacking the spine), ex libris New England Historic-Genealogical Society, with their stamp of withdrawal, last leaf torn with loss, edges untrimmed throughout, some discoloration to last leaf, 11 1/4 x 8 3/4 in. Bowdoin (1726-1790) was an intellectual leader during the American Revolution, a Governor of Massachusetts, and a founder and first president of the American Academy of Arts and Sciences.